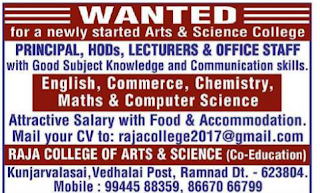 Raja College of Arts & Science has advertised in The Hindu newspaper for recruitment of Principal/HOD's/Lecturers/Office Staff job vacancies. Interested and eligible job aspirants are requested to apply immediately. Check out further more details below. Name of the College: Raja College of Arts & Science, Vedhalai post, Ramnad Dt. 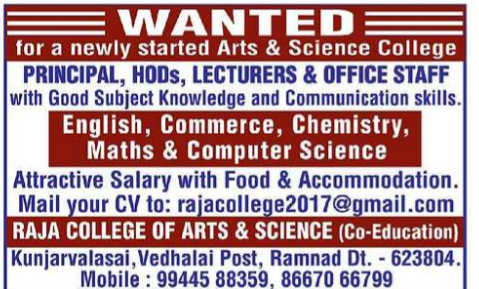 About College:The Raja College arts and science newly started in Ramnad district.this offers all under graduate courses at present. Attractive salary with food and accommodation.